Our beautiful medieval Parish Church stands on the northern edge of the original Wantsum Channel and the southern edge of the village.It receives many visitors each year as it features in both “Pevsner's Guide” and Simon Jenkin’s “England’s thousand best churches”. Known as the “Cathedral of the Marshes”, people are surprised at the size of it. We have a weekly Book of Common Prayer Service followed by a more informal Common Worship Service with refreshments served after both services. The children are well catered for most weeks in Connections - our Sunday School. There are several opportunities each year to meet and celebrate ecumenically with other christians in the area; the Roman Catholic sisters at the Abbey; St Mildred’s Priory, the local Salvation Army and the Methodists at the nearby village of Monkton. The local Roman Catholic priest holds a Mass in the Church most Wednesdays at noon. Whether as a tourist or a worshipper, we hope you enjoy your visit to Minster Parish Church. Come and enjoy the peace-filled calm. Minster village has a population of just under 4,000. It is an extremely well resourced village which won the Calor Village of the Year County Winner in 2009. It has a two form entry CoE primary school, lively parish council with Village website and magazine, Minster Matters and shops and pubs. One of the popular annual village events is “Open Gardens”. This usually involves up to 20 gardens being open over a weekend. 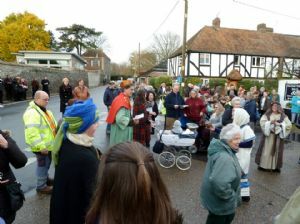 The money raised is given for the mainenance of the fabric of the Parish church. Remembrance Day is a community event when members of the local British Legion march to the parish church for a ceremony. The Community Carols (inside or out) are testament to the close community spirit. The ground upon which the church of St. Mary the Virgin now stands, has long been hallowed as a place of worship. Originally founded in 670AD as a small monastic parish church, it would have been built using the inexpensive materials of mud and wood. Today, the present church was started by the Saxons and enlarged and absorbed by the Normans. The chancel is typically ‘Early English’ in architecture and style, and the beautiful nave has remained in its present form since 1150. 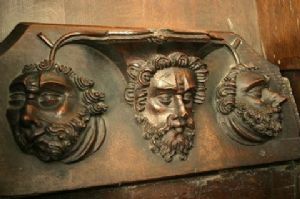 St. Mary’s Church, traditionally called the ‘Cathedral on the Marshes’ boasts a set of eighteen superbly preserved Misericords (Quire Stalls). At the west end of the nave, it is interesting to observe the Roman bricks, which were used in the masonry of both the wall and the Norman tower. An older Saxon turret is also incorporated into the massive Norman tower, carrying a belfry with a peal of five bells. St Mary’s church spans centuries, but still retains to the glory of God an indescribable, peace-filled calm. We urge you to come and visit! The Old Schools, conveniently situated in the churchyard, was originally the village school from 1847-1946. 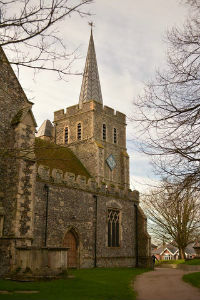 It’s now put to good use by the church for community functions, and hired by local residents.